I don't think anyone has made a good case for using barbless hooks to help to prevent fish mortality. Since the beginnings of catch and release fishing back in the 50's in Pennsylvania with the Fisherman's Paradise on Spring Creek and later the first catch and release section on Young Woman's Creek, the controversy over using barbless hooks to help to prevent fish mortality has raged on. Some states require barbless as a part of their C&R regulations, but most do not. A consensus will probably never be reached. I'm really not going to address fish mortality here. Personally I think it is a moot point. I know that I have hooked many fish in the artery in the bottom of their mouths or in the gill rakers over the years leading to extensive bleeding and ultimate death. The fact that I have always used barbless hooks has probably done nothing to prevent those casualties. The point of this article is to reinforce the simple fact that removing hooks from fishes mouths when there are no barbs will always be easier and cause less damage to the fish. 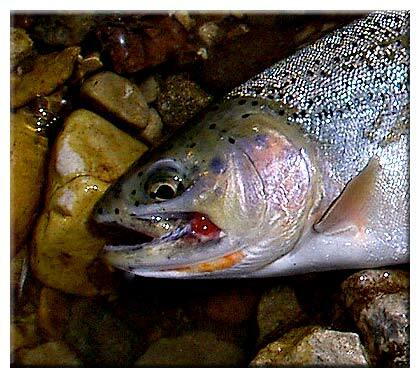 Most hook injuries to fish are to the outer edges of the fish's mouth leading to lip plate loss, scar tissue, and ultimate extensive deformity. In other words, the old cliche, "rip them lips" surely is just that. Hook a strong fish in the lip plates, and he will tear them loose from the thin membranes that attach them to the head and, in some cases, completely remove them. What remains is an ugly visage that it is hard for even the insensitive to overlook. About five years ago, I got so overwhelmed by the crowds and the monsters of abuse I was catching in the various tail-waters I've fished all over the country that I finally decided I just couldn't stand it any more. 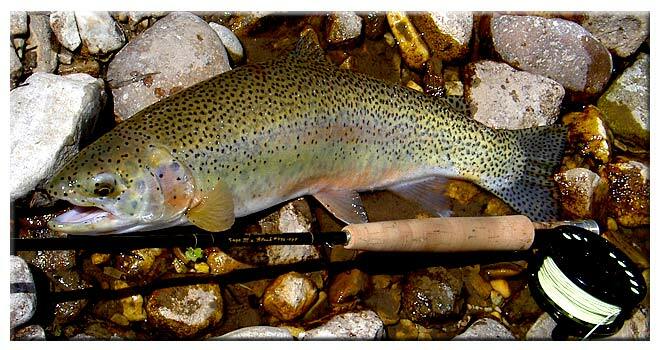 Most of our tail-waters are either stocked with catch and grow rainbows or sustainable populations of rainbows, cutthroats, or cutbows, often all three. 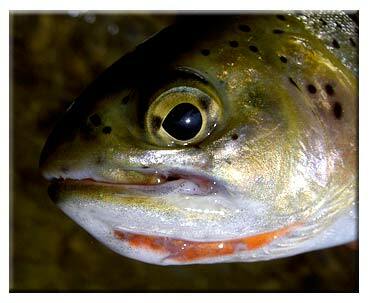 Of all the trouts, those species have the most fragile mouth parts. 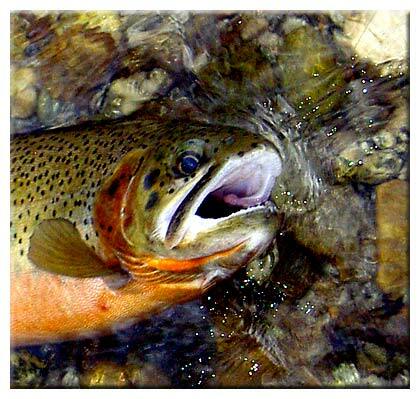 The lip plates of those fish are often removed in the process of the first hard run when the fish is hooked. Those long distance releases fishers talk about often result in lip plates being torn off. Think of the times you have retrieved a fly only to find it imbedded in a lip plate. It is a sickening sight to see it clinging there and an even more sickening sight to see the fish with one or both amputated. 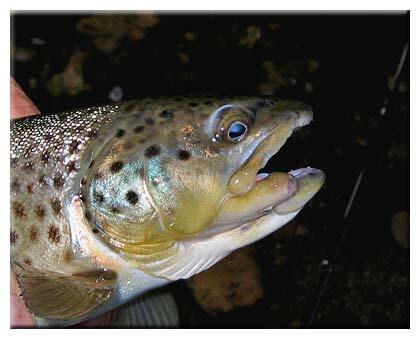 Large nymph hooks, like used in many tail-waters in early season to imitate salmon fly larva, are probably responsible more than most for those casualties. In reading back over my journal entry for my last evening on the Madison a few years ago. I caught nine rainbows, three browns, and one whitefish. Every one of the rainbows was devoid of one or both of its lip plates. A couple had hideous balls of red scar tissue in the the left corner of the mouth. 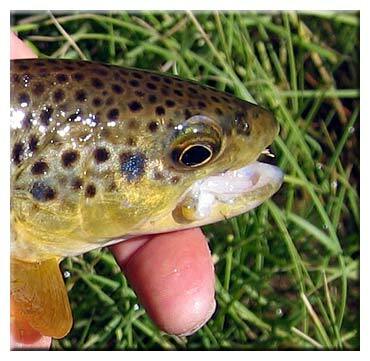 If you fish the left side of the river you will find the most damage to the left side of fish's mouths since they face up stream and your take will pull the fly into the left corner of the mouth. One of the browns was badly mutilated, while the other two were reasonably unharmed. The whitefish was just fine and lucky a thoughtless fisher hadn't thrown him up on the bank to rot in the sun. The whitefish was the largest, incidentally. My final comment for the entry was, "I can't take it any longer." The pictures you see here were all taken this year. I quickly scanned through 88 folders of image files to this date late in August this year and found but about a dozen damaged fish in probably a little more than 700 fish images. I know that I intentionally photographed the opposite side of several damaged fish, but did intentionally photograph some badly damaged ones too. I don't catch a lot of damaged fish, any more, primarily because I fish many less obvious waters where the fish are much less frequently caught, and many of the fish I catch are smaller ones. Over half the fish you see here are less than a foot long, some not much over eight inches. I don't think any of them were injured in the fight. All were injured by fishers removing hooks. You can see that many of the injuries are quite extensive. Removing a large barbed hook from a small fish is quite likely to lead to extensive damage. Simply removing the barb from a hook will make it so so much easier to get it out of any part of the fish's mouth and your own hand, for that matter. Why anyone practicing catch and release fishing wouldn't want to make his experience so much easier by pinching down the barbs is totally beyond me. Looking at these several pictures should convince you that what we do in our fishing is not always pleasant and at the worst is down right abusive. Surely removing the barbs is a small price to pay to prevent some of what you see here. The first thing I do when I tie a fly is pinch down the barb. I don't have and never will have a barbed hook in my fly box. When I get a fly imbedded to the bend in my thumb, I can pull it out easily. 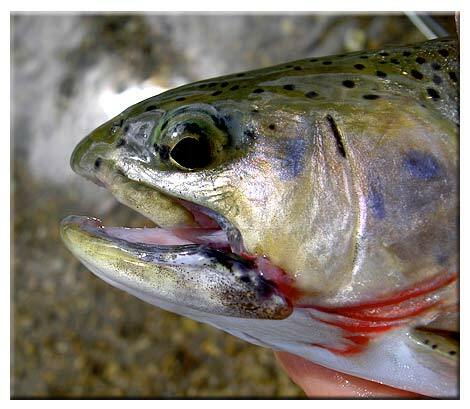 When I get a #10 Los Alamos Ant imbedded in the lip plate of a ten inch west-slope, I can get it out easily, allowing that fish to go free with his mouth intact so the next guy who catches him won't cringe like I do every time I catch a fish like the ones you see here. 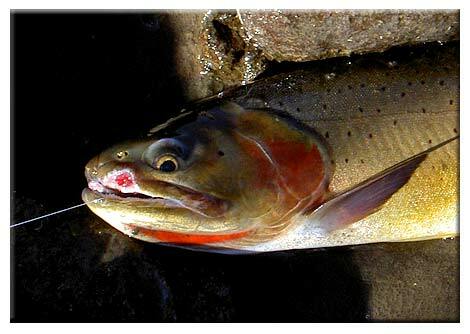 If you think the cutbow below is a beautiful fish, then just consider how JLo would look without lips.